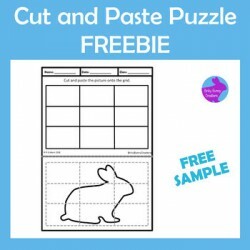 IEP Goals: Given a picture with a two-step direction to trace and then draw (copy from a model), STUDENT will independently complete the activity, with 80% accuracy, in 4 out of 5 opportunities, by MONTH, YEAR. 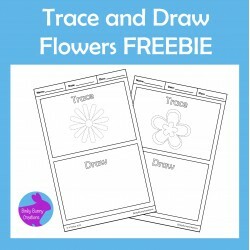 Given a picture with a two-step direction to trace and then draw (copy), STUDENT will independently complete the activity, with 80% accuracy, in 4 out of 5 opportunities, by MONTH, YEAR. 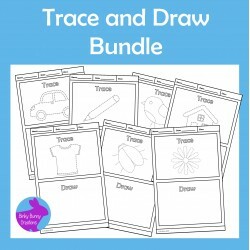 IEP Goals: Given a picture with a two-step direction to trace and then draw (copy), STUDENT will independently complete the activity, with 80% accuracy, in 4 out of 5 opportunities, by MONTH, YEAR. 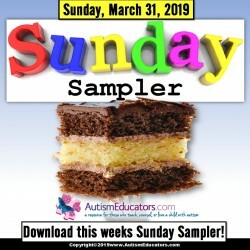 IEP Goals: IEP Goals are listed with each of the products included with this Sunday Sampler. 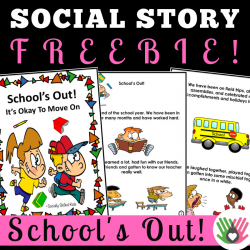 IEP Goals: Given a social story related to school (end of school year), STUDENT will read or listen to the story and ask or answer up to ____(number of) questions pertaining to his/her personal experiences (what he/she does over the summer/how he/she feels at the end of the school year), in 4 out of 5 trials, by MONTH, YEAR. IEP Goals: Given an instructional level reading passage, STUDENT will _________(independently/with prompts) read and mark the correct response out of a field of up to four possible answer choices, with 80% accuracy, in 4 out of 5 opportunities, by MONTH, YEAR. Given a reading passage read aloud by STUDENT (or the teacher), STUDENT will describe what is occurring in the picture and state the act of kindness shown, in order to provide correct responses to four questions, with 80% accuracy, in 4 out of 5 opportunities, by MONTH, YEAR. 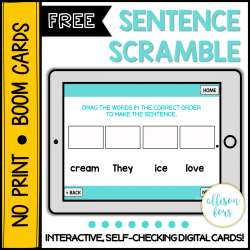 IEP Goals: Given words placed in random order, STUDENT will move the words within the correct positions in order to form a complete sentence, with 80% accuracy, in 4 out of 5 opportunities, by MONTH, YEAR. 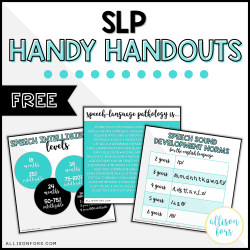 IEP Goals: ***This is a FREE informational resource for parents and teachers. Enjoy! IEP Goals: Given a simple token reward system in order to complete a task or improve positive behavior, STUDENT will place a token on the board as each task is completed, with 80% accuracy, in 4 out of 5 opportunities, by MONTH, YEAR. IEP Goals: Given a visual which indicates safety measures within a specific location (ex. 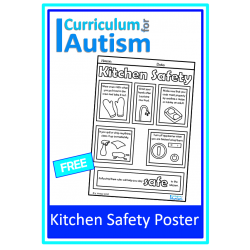 kitchen), STUDENT will _________ (read/listen to an adult read aloud) the safety rules and provide one example of how the item can be used safely, or the procedure followed, with 80% accuracy, in 4 out of 5 opportunities, by MONTH, YEAR. This is a BUNDLE containing 11 items. 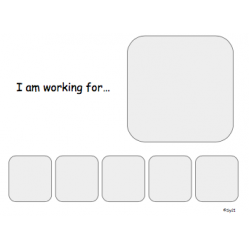 Given a set of four pictures with only three being the "same", or identical, STUDENT will mark or point to the one that is NOT the same, with 80% accuracy, in 4 out of 5 opportunities, by MONTH, YEAR. Given pictures of objects to sort by size (big and small), STUDENT will place the pictures in the correct category, with 80% accuracy, in 4 out of 5 opportunities, by MONTH, YEAR. 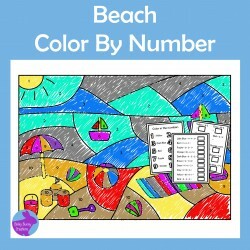 Given a story related to a holiday (read by STUDENT or adult), STUDENT will match the pictures to the correct pages, demonstrating comprehension of the details, with 80% accuracy, in 4 out of 5 opportunities, by MONTH, YEAR. 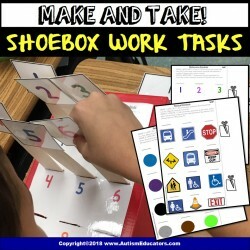 IEP Goals: Given a familiar or pre-taught skill independent work task to complete, STUDENT will complete the task within a pre-determined amount of time, with 80% accuracy, in 4 out of 5 opportunities, by MONTH, YEAR. This is a BUNDLE containing 15 items. 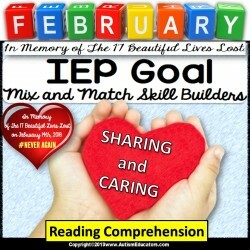 IEP Goals: Given a social scenario presented as a question (yes or no/responsible behavior), STUDENT will mark, clip,provide a verbal response, or indicate on voice output device, whether it shows responsible behavior with a "yes" or "no" response, in 4 out of 5 opportunities, by MONTH, YEAR. Given a brief written social scenario and a choice of two emotions, STUDENT will mark, say, point to, or indicate on a voice-output device, the emotion he/she would most likely feel, with 80% accuracy, in 4 out of 5 opportunities, by MONTH, YEAR. Given a question related to a social scenario, STUDENT will respond with a "yes" or "no" answer to determine if the person has good manners, with 80% accuracy, in 4 out of 5 opportunities, by MONTH, YEAR. 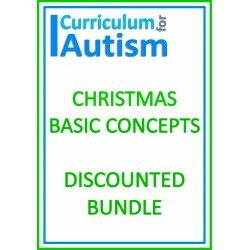 Given a question related to a social situation (gift giving), STUDENT will read/listen to the scenario and determine which gift would be more appropriate, with 80% accuracy, in 4 out of 5 opportunities, by MONTH, YEAR. Given a one sentence scenario, STUDENT will determine if the act described is representative of kindness, sharing, gentle, or helpful, by responding with a "yes" or "no" response by marking the response or providing a verbal response, with 80% accuracy, in 4 out of 5 opportunities, by MONTH, YEAR. Given a scenario related to weather, environment, or social situation, STUDENT will determine what type of clothing should be worn by providing a written or verbal response/choosing "casual" or "smart", with 80% accuracy, in 4 out of 5 opportunities, by MONTH, YEAR. Given a written scenario described as "safe" or "unsafe", STUDENT will mark the correct response, with 80% accuracy, in 4 out of 5 opportunities, by MONTH, YEAR. Given a question in which a scenario is provided, STUDENT will write, type, or say an appropariate solution to the problem, by including up to three details in sentence or list form, with 80% accuracy, in 4 out of 5 opportunities, by MONTH, YEAR. Given a written scenario designed to invoke a response to a situation which may be associated with an emotion, behavior, or social skill, STUDENT will provide a written or verbal solution to the sentence starter, "What could I say? ", in 4 out of 5 trials with 80% accuracy, by MONTH, YEAR. Given a written scenario and a choice of "yes" or "no" response, STUDENT will independently read/listen to the scenario and using prior knowledge, will determine if the situation presented is "safe" or "unsafe", with 80% accuracy, in 4 out of 5 opportunities, by MONTH, YEAR. Given a scenario in which a problem must be solved, STUDENT will ____________ (read or listen to the teacher read the scenario aloud), in order to determine the solution by describing what needs to happen, in 4 out of 5 trials , by MONTH, YEAR. Given a verbal or written one sentence scenario related to a topic or theme (first aid), STUDENT will complete the sentence by choosing the correct response, with 80% accuracy, in 4 out of 5 opportunities, by MONTH, YEAR. Given a question with a choice of two possible responses, STUDENT will respond to the question asked, "Which is more important? ", by marking the most appropriate response, with 80% accuracy, in 4 out of 5 opportunities, by MONTH, YEAR. 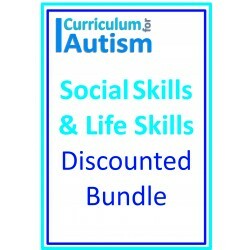 Given a written scenario with a questions based upon social, safety, or a life skill, STUDENT will provide a ________written/verbal answer which includes how they would appropriately respond to the situation, with 80% accuracy, in 4 out of 5 scenarios, by MONTH, YEAR.